Fibromyalgia is a term used to define the combined symptoms of global muscle stiffness, fatigue and increased sensitivity to pain. This chronic condition, also known as fibromyalgia syndrome (FMS) causes pain throughout the body, particularly around certain joints. The pain can be in areas such as the neck and lower back, although there is not generally inflammation present in the areas of pain. People suffering from fibromyalgia may also experience difficulty sleeping, memory loss and headaches. Due to its chronic nature, most patients will require long term management of their symptoms. Certain treatments have been known to help relieve the symptoms (see below). However, they are unlikely to completely disappear. Whilst fibromyalgia can affect both men and women, around 7 times more women are affected by the condition, which typically develops between the ages of 30 and 50 years old. As fibromyalgia is difficult to diagnose, due to symptoms being similar to those of a number of other conditions, it is unknown exactly how many people are affected by the condition. Understanding of fibromyalgia is still somewhat limited and the exact cause is unknown: however, it is believed that symptoms can arise from changes in the central nervous system, including the brain. Episodes of fibromyalgia are commonly linked to periods of emotional stress, anxiety and/or other illness. WHAT SYMPTOMS ARE EXPERIENCED WITH FIBROMYALGIA? Patients with Fibromyalgia can experience varying groups of symptoms which may also differ from day to day. According to Fibromyalgia UK, an organisation offering information and support to people with fibromyalgia, the pain tends to be experienced as an aching or burning sensation and is often described as ‘head to toe’. The fatigue experienced by sufferers can range from a feeling of tiredness to the type of exhaustion associated with a flu-like illness. Alongside global muscle stiffness, fatigue and increased sensitivity to pain they also commonly report difficulties with concentration, low mood and headaches. As there is no specific test to diagnose fibromyalgia, diagnosing the condition can be difficult. GPs sometimes use this diagnosis when other possible causes for the symptoms have been ruled out. Chronic fatigue syndrome – a condition which causes long term tiredness. Diagnosis is made when both prolonged mental and/or physical stress have led to disruption of normal body functions. Rheumatoid arthritis – a multiple joint arthritis caused by an overactive immune response. It is commonly hereditary and causes pain and swelling in the joints. Multiple sclerosis – a disease of the nervous system where areas of the spinal cord harden. This can lead to a variety of symptoms individual to the patient. When diagnosing fibromyalgia your GP will first rule out these conditions. 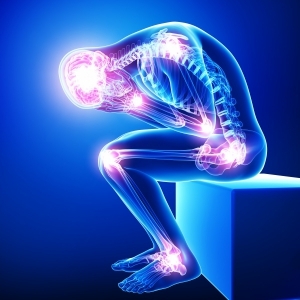 Fibromyalgia treatments are aimed at easing the symptoms and improving quality of life. Due to the varying symptoms, certain treatments may only provide relief for some of the symptoms experienced. For this reason, a combination of treatments may be recommended – for example lifestyle changes and medication. Medication prescribed by the GP may include painkillers and antidepressants. GPs will oversee most decisions relating to treatment and care but other medical practitioners may be involved such as rheumatologists, neurologists and psychologists. Hydrotherapy (exercise in a heated pool) – can relieve stress on joints, promote relaxation and help you to better cope with the pain of fibromyalgia. Exercise programmes – a tailored exercise programme can help you manage your symptoms and improve your overall health. Talking therapies such as CBT (cognitive behavioural therapy) or counselling – approaches that can help you deal with fibromyalgia issues and symptoms in a more positive way. Massage Therapy – all Forge Clinic massage therapy sessions are unique to the individual and your therapist will discuss yours symptoms and experience of fibromyalgia before your massage therapy begins. Acupuncture – can help reduce fibromyalgia symptoms, enabling you to adapt to the condition. Manipulation – can give temporary relief from pain, helping you sleep better. Aromatherapy – some people find aromatherapy helps them to relax and reduces the stress associated with fibromyalgia. Our practitioners at The Forge Clinic, Richmond are experienced in helping fibromyalgia sufferers reduce and control their symptoms, helping them return to a normal life as possible. With Physiotherapy and Osteopathy, treatment of fibromyalgia commonly consists of desensitising the nervous system, pain education, lifestyle adjustment and specific movement prescription. Massage therapy can create a feeling of deep relaxation, which will help improve sleep. This deep relaxation can also reduce stress, pain and muscle tension which be very effective in alleviating some of the symptoms of fibromyalgia. Acupuncture therapy can help relieve the symptoms of fibromyalgia, making the condition easier to live with and the NHS believes there is ‘reasonably good evidence’ that acupuncture is effective in treating certain types of pain particularly associated with fibromyalgia. One of our Forge Clinic patients with fibromyalgia finds that a combination of physiotherapy or osteopathy with acupuncture works best for her. You can read her case study and find out more about the use of Acupuncture in the management of fibromyalgia symptoms on our Acupuncture and Fibromyalgia factsheet. The goal for all the treatments we offer is to help you to manage and cope with the pain and symptoms you are experiencing so that you can enjoy your normal activities and lifestyle. Please note that our treatments and therapies do not replace medical advice and treatment. If you have any concerns, please see your GP first. If you are experiencing fibromyalgia symptoms and would like to talk to one of our specialist therapists, please call us on 020 8332 6184, email us at info@theforgeclinic.com or book online. Error: Error validating access token: Session has expired on Sunday, 10-Mar-19 07:26:37 PDT. The current time is Monday, 22-Apr-19 05:53:50 PDT.